Herb Infused Coconut Oil. Photo by Shannon Stonger. At its most basic an herbal salve is a combination of dried herbs, a carrier oil, beeswax, and essential oils. Each of these elements plays a crucial part in healing, preserving, and application. Choosing the best of all of these elements ensures the highest quality salve. While several good salves are available commercially, making them yourself holds many advantages. Like food preparation, doing it yourself ensures the highest quality of ingredients can be used. Many believe, and rightfully so, that what you put on your skin matters. Toxic chemical residues, rancid fats, and preservatives can all be found in cheap commercial salves. No fillers or questionable oils go into the making of your salve. You have complete control over the type and quality of the herbs used. Furthermore, you can personalize the salve to the needs of a sensitive baby or an active teenager, depending on the herbs and essential oils you choose. Coconut Oil – As a carrier oil, coconut oil acts both as the vehicle for transferring the healing properties of the herbs as well as a form of nourishment to the skin in its own right. The anti-bacterial and antioxidant properties of coconut oil also help to naturally preserve the salve. Beeswax – Good quality beeswax turns the infused herbal oil into a smooth, easy-to-apply salve. More importantly, beeswax acts as a moisture barrier for the skin, sealing in the rich herbal oil and keeping out unwanted moisture or debris. Beeswax is generally sold in blocks, which can be grated when used, or pastilles, which are small pearls of beeswax ready for melting. St John’s Wort – Most widely known for its ability to calm and soothe the nerves, St. John’s Wort is also helpful for maladies of the skin. This herb will lend your salve its ability to bring down inflammation and aid cuts, bruises, rashes, scrapes, and the like. Yarrow – Known widely for its aid to bleeding wounds, yarrow is also helpful for bruises, rashes, swelling, and sprains. Calendula Flowers – Known as one of the best soothers of the skin, calendula has a place in every salve. The flowers of the calendula plant infuse the oil with their healing properties while the yellow flowers imbue the herbal oil with a delicate color. For burns, rashes, diaper areas, and general scrapes and scratches; calendula’s healing properties are perfect for an herbal salve. Comfrey – One of the must-haves for every herbal cabinet and garden, comfrey is one of the most reliable herbs to have in your arsenal. Comfrey has also been known as knitbone for its tissue-mending properties. Used on sprains, strains, and breaks, it also aids in decreasing both swelling and pain. Tea Tree Essential Oil – For scratches and cuts, tea tree oil is an excellent replacement for Neosporin. It is anti-bacterial and anti-fungal as well. Tea tree oil is considered a “hot” oil in that its potency can burn sensitive skin. For that reason only small amounts are necessary for a broad spectrum salve such as this. Lavender Essential Oil – Soothing, calming, and healing; lavender is known for its ability to heal and soothe the skin. Its calming effect is also of importance in situations where trauma has occurred and the emotional aspect of cuts and burns need just as much tending as the physical ones. Making a salve is about ratio, much like baking. For that reason I give you the general ratio and parameters of the process so that you can replicate it at home with coconut oil, beeswax, and whatever dried herbs and essential oils you wish to use. The first step is to infuse the coconut oil with the herbs. You can use those listed above, which are included in the salve found in the photos, or you can use herbs specific to certain ailments. This salve is what is known as a Heals-All salve with a wide range of properties. To infuse the coconut oil you can choose one of two methods. The first is a slow infusion through the power of the sun. The herbs are added to the oil, making sure it covers the herbs by at least 1 inch. This is then put into the sun to infuse for at least two weeks and up to six weeks. The other method is a quick method that is done at low heat. This can be accomplished via a crockpot set on warm or low, a very low double boiler, or a dehydrator or low-temperature solar oven. The herbs and coconut oil are placed in a bowl or jar, as indicated in the previous method, and placed in a 100 – 140 degree environment for a few hours or up to a couple of days. 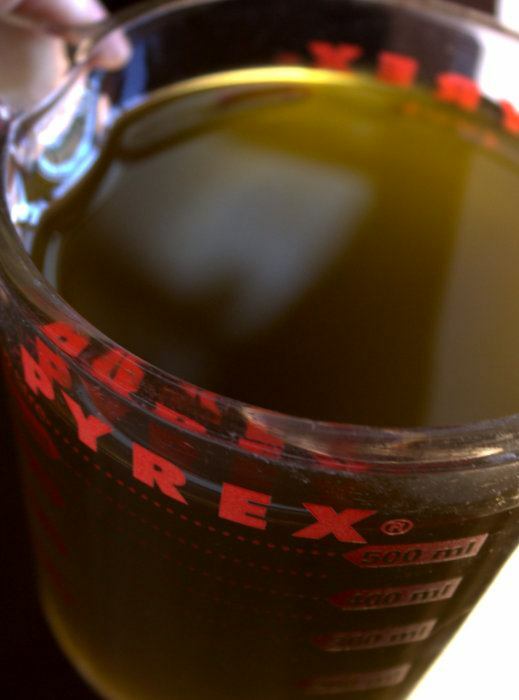 With either infusion method your oil should take on some of the color of the herbs themselves, indicating a transfer of the properties of the herbs into the oil. Once this is achieved it is time to drain the oil from the dried herbs. This is best achieved with several layers of good cheesecloth, butter muslin, or a clean tea towel that you don’t mind leaving with a bit of a stain. Place a sieve over a bowl and line it with the cheesecloth, muslin, or towel. Slowly pour the oil and herb mixture into the lined sieve and allow it to drain. Repeat with any remaining oil and herbs until all herbs and oil have been transferred to lined sieve. Now carefully wring the herbs in the lined sieve until as much of the oil has been removed as possible. Dispose of the dried herb remnants. Once this step is done, the salve will come together with the integration of the beeswax and essential oils. Simply mix in 1 ounce of beeswax for every 8 ounces of herb-infused oil using a double boiler. Once the beeswax melts into the oil, remove it from the heat, stir in 10-20 drops of your chosen essential oils per one cup of herbal oil, and quickly pour the liquid salve into waiting containers. Because coconut oil hardens in cooler climates, it is a good idea to store this salve in a warmer part of your home. 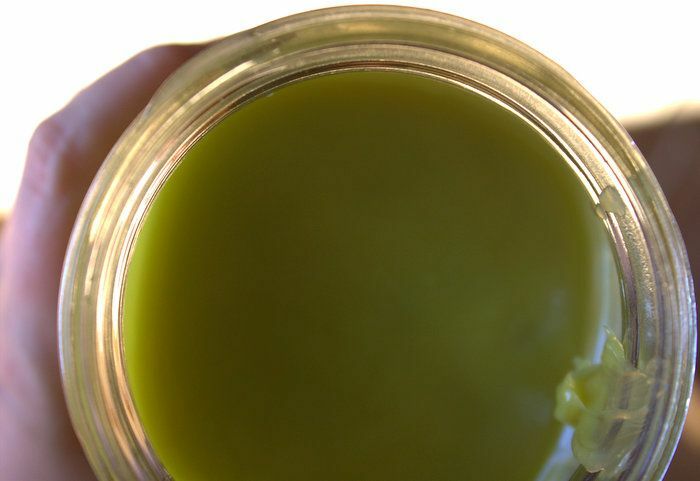 If needed the salve can be placed next to a warm oven or warmed in the palms of your hand in order to make it more spreadable when the need arises.